MOST EFFICIENT & POWERFUL, High Quality water ionization technology in the WORLD. AutoAdjustTM optimizer automatically adjusts the water ionizing power giving the Best Performance & Ionization for your particular water source. Smart Switch™ next generation SMPS power supply provides the Most Stable & Efficient power platform. AutoClean fully automatic post use cleaning ; protects your investment. With the most advanced Features & Technology, and backed up by Emco Tech's Durability & Performance, the VESTA water ionizer will provide you with Years of the Highest Quality Performance. PAYMENT IN INSTALLMENTS AVAILABLE.CONTACT US! Looking for ULTIMATE PERFORMANCE in water ionization? Emco Tech’s Global Leader group manufactured the MOST EFFICIENT & PERFORMANT, High Quality water ionization technology in the WORLD. The result is THE next generation AlkaViva Vesta GL 988 water ionizer. 9 high-efficiency platinum titanium electrodes(water electrolysis /ionizatin plates) deliver more power per square inch than larger less sophisticated electrodes, requiring large wattage(thus longer life for the Vesta GL 988 water ionizer). When it comes to performance & technology (incluiding water ionizers): Think small. Think efficient. AutoAdjustTM optimizer automatically adjusts the water ionizing power giving the Best Performance & Water Ionization depending to the filtered water that enters the water ionization cell. AutoClean fully automatic post water ionizer use cleaning for the water ionization/electrolisys plates – unlike other water ionizers, never wait for your ionized alkaline water & protects your investment. A water ionizer’s performance always varies depending on the minerals present in your water. In other brand water ionizers this fluctuation in water mineral content creates unstable results from day to day and from place to place. The AlkaViva Vesta GL 988 water ionizer/purifier is the ONLY water ionizer that overcomes this for you –automatically. 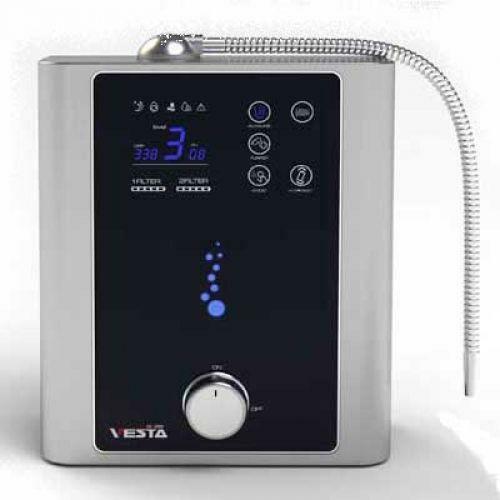 The AlkaViva Vesta GL 988 water ionizer/purifier’s AutoAdjustTM technology consistently creates ionized water with the ultimate pH and ORP by adjusting the way power is applied to the water ionization plates to match the amount of minerals present in your filtered water just before it enters the water ionization cell. The AlkaViva Vesta GL 988 water ionizer/purifier is the FIRST & ONLY water ionizer/ purifier that offers this level of advanced sophistication. Using advanced pulse width modulation, AutoAdjustTM delivers more Activated Alkaline Ionized Water. AutoAdjustTM supplies the electrical energy in variable short, sharp bursts or punches. AutoAdjustTM varies pulse time or widths based on the mineral content in your water as determined by the on-board computer. NO OTHER water ionizer can do this. This causes the water ionization/ electrolisys plates/ electrodes to act in a more excited and energetic way creating more active production of oxygen from the electrode, and therefore more activated ionized alkaline water. The result is ionized water with a bigger change in pH and better ORP. With AutoAdjustTM technology, you always get optimal performance in water ionization and benefit, NO matter where you live or what your water quality. Every time. Easy. Automatic. Only from AlkaViva. The output signal (blue) is compared with the limits (green). These limits correspond to the reference signal (red) which is the fed back to the AlkaViva Vesta GL 988 water ionizer/purifier’s advanced circuitry from the conductivity in your water (relative to the minerals) and offset by a given value. Every time the output signal reaches one of these limits, AutoAdjustTM changes the signal or pulse width effectively adjusting the power relative to the minerals in your water and to the setting selected. Smart Switch™next generation SMPS The AlkaViva Vesta GL 988 water ionizer/purifier employs the most-advanced Switch Mode Power Supply technology in order to operate it’s unique AutoAdjustTM feature. Current generations of SMPS offered by other water ionizer companies cannot automatically adjust voltage on demand to match varying water conditions. The advanced SMPS used in the AlkaViva Vesta GL 988 water ionizer/ purifier is able to deliver that functionality. SMPS is known as a power-saving option as it only uses the amount of power necessary to ionize water in relation to minerals present in it. Two water filters consisting of 0.1 micron water filters combine with space-fiber technology to efficiently filter almost any tap water. The water filter life change indicator lets you know when it’s time to replace your water filters. Only Emco Tech water ionizers work with the USA made and certified UltraWater filters(that remove 99.9% of ALL known water contaminants- and ONLY contaminants, NOT the healthy, natural minerals ) and in the AlkaViva Vesta GL 988 water ionizer/purifier you have the ability with its two ionized water filters to really make sure your water is filtered properly. 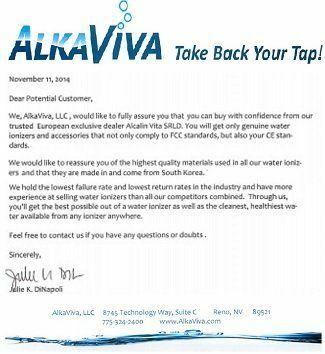 AlkaViva’s new UltraWater filters provide the best internal water filtration ever created for water ionizers. All water ionizers have water ionization plate cleaning systems which are crucial to water ionization performance, fiability and durability, but not all cleaning systems are equal or even close. One more important advantage of AutoAdjustTM, is that calcium and other minerals can NOT attach themselves to the electrodes/ water ionization plates. With the electrodes switching on and off so quickly and pulsing differing widths, minerals don’t have the time or stability to form a bond with the surface of the electrode. Other less sophisticated water ionizer brands cause you to periodically wait for your alkaline ionized water. The AutoClean reversal mechanism operates in the background of the AlkaViva Vesta GL 988 water ionizer/purifier, always cleaning the water ionization plates and never interrupting the flow of alkaline ionized water. You never have to wait or worry. Easy. Elegant. Effective! Only from AlkaViva. Advanced self-diagnostic MICOM circuitry system allows for the advanced technology to function and protects your investment. Smart Sensors signal excessive temperatures either from power surge or water temperatures and shut your water ionizer down to protect it. 9-Ultra Efficient Electrodes/water ionization plates , made of the highest grade Titanium / Platinum for durability & efficient water ionization. EmcoTech water ionization plate manufacturing remains state of the art, using proven best-practices – the NO 1 choice – the MOST water ionizers sold worldwide. World renown companies like Tennant Company & others chose to stake their reputation on Emco Tech water ionization plate performance and durability. Small footprint and elegant black and stainless-look design complement any modern kitchen decor. Experience the elegance and efficiency of a designed water ionizer! AlkaViva water ionizers out perform other brands with more or larger electrodes and more wattage, because more amps are delivered per square inch of electrode. So looking for ultimate power in water ionization? New AutoAdjust™ and SmartSwitch™ technology! The AlkaViva Vesta GL 988 water ionizer/purifier Is The Most Technologically Advanced Water Ionizer In The World! 9 high-efficiency platinum titanium water ionization electrodes deliver more power per square inch of water ionization electrode than larger less sophisticated electrodes requiring large wattage. The AlkaViva Vesta GL 988 water ionizer/purifier has an onboard water flow control valve that allows you to fine tune the water ionization performance (by controling water -electrode contact time )and gives you true functional control of the water pressure through your water ionizer. By controlling the water pressure throughput, you can fine tune the pH and ORP ranges of the ionized water to your exact needs. This Liquid Crystal Display shows cascading lights to indicate the rate of water flow through your AlkaViva Vesta GL 988 water ionizer /purifier. This helps to give you a “visual” of how fast the water is flowing through your water ionizer. Too slow of a water flow can damage any water ionizer. Emco Tech has built in an LCD panel indicator that will illuminate when there is not enough water pressure going into your AlkaViva Vesta GL 988 water ionizer / purifier to operate it safely. This feature safeguards the water ionization cell and protects your investment. The AlkaViva Vesta GL 988 water ionizer / purifier has a glass tube fuse that will protect the expensive circuitry in case of power fluctuations or surge. Hot water can damage your water filters. This LCD alarm will illuminate when you accidentally put hot water into your AlkaViva Vesta GL 988 water ionizer / purifier to safe guard it, and its water filters, against damage. The feature works by applying an algorithm that factors in all the variables at each water ionization setting to give you an approximate pH/ORP value for the ionized water (at median power delivery for the selected water ionization setting). This feature audibly tells you what type of water(ionized alkaline water/ionized acidic water/ purified water) you’ve selected each time you use the AlkaViva Vesta GL 988 water ionizer & purifier . This feature is fully adjustable allowing you to turn the volume up, down, or off. The voice confirmation function can be set to either English, Spanish, French or Korean. The AlkaViva Vesta GL 988 water ionizer & purifier offers you a way to track the water filter life of each of the two water filters. It counts actual water filter use – it is not a timer like on less expensive water ionizer models. It works much like the odometer on a car. Combined, these two water filters inside the AlkaViva Vesta GL 988 water ionizer & purifier will eliminate almost all known water contaminants with an amazing 99.9% removal rate. AlkaViva Vesta GL 988 water ionizer & purifier comes with a standard sediment filter and the new UltraWater filter. For those with well-water, you can purchase the .01M Hollow Fiber Ultra well water Filter to remove particulates, sediment, bacteria, parasites, cysts, etc to an amazing 1/100th of a micron. Because of its DOUBLE-water filter configuration the AlkaViva Vesta GL 988 water ionizer & purifier allows for a host of water filters combinations to address your exact water type and exact contaminant level. AlkaViva Vesta GL 988 water ionizer comes with everything you’ll need to perform a standard installation. Unique or custom installations may require extra parts and or adapters. This beautiful manual was written by AlkaViva – Download it Vesta GL 988 water ionizer_Manual. MOST EFFICIENT & PERFORMANT, High Quality water ionization technology in the WORLD. 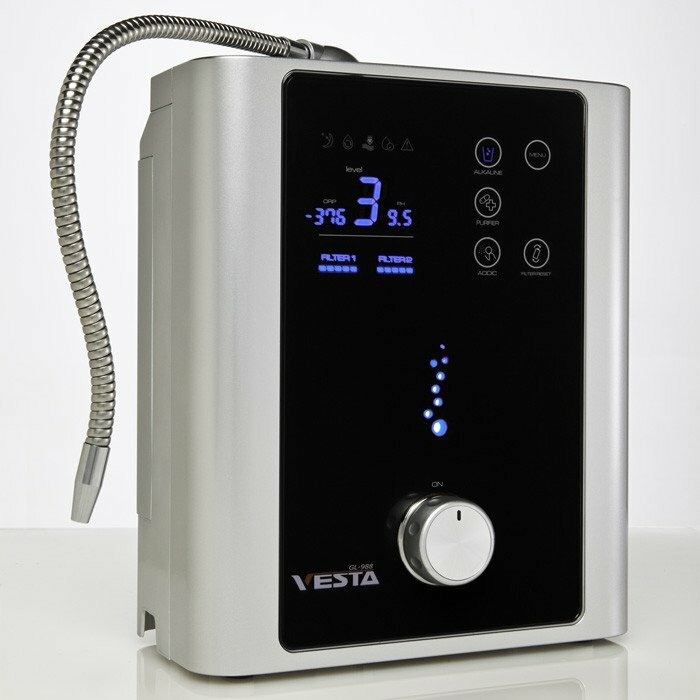 THE next generation Vesta GL 988 water ionizer. Most advanced Features & Technology, backed up by Emco Tech’s Durability & Performance, the VESTA GL 988 water ionizer will provide you with Years of the Highest Quality ionized water & Performance . AutoAdjustTM optimizer automatically adjusts the water ionizing power giving the Best Performance & water Ionization for your particular water source. Patented DUAL Ultrawater filtration ensures your water is cleaned,FREE from ALL harmful water contaminants before water ionization. AutoClean fully automatic post use water ionization cell cleaning – unlike other water ionizers, never wait for your ionized water & protect your investment. What is a water ionizer & purifier? A water ionizer & purifier is an electronic device that 1, filters water and 2, achieves water ionization- separation of water into alkaline ionized water and acidic ionized water streams, directly from your tap water, by a method of water electrolysis or water ionization – the method of producing a concentration of alkaline and acidic minerals – separating the oxygen and hydrogen found in water (H2O). The alkaline water provides an antioxidant and electron rich medium for consumption, and the acidic water provides oxidizing water that works like an antibacterial and cleanser for external use. How does AlkaViva Vesta GL 988 water ionizer & purifier hook up to my tap water? The AlkaViva Vesta GL 988 water ionizer & purifier sits neatly on your countertop near your sink, can be mounted on your wall It hooks directly up to your faucet with a diverter valve that allows you to alternate between running water through the water ionizer or running water through your faucet. It is a flow-through unit so your water is filtered and ionized instantly. There are no tanks to fill. The water travels through the water filters and then the water ionizing chamber quickly, producing about 3 liters of filtered/ ionized water per minute. The water ionizer also has to be plugged in, so you will want to make sure you have an electrical outlet near the water ionizer. 4 levels of alkaline ionized water ~ Why? Extra levels of pH for ionized alkaline water means greater choice for you and other users. It also allows you to take advantage of higher alkaline ionized water pH levels when cooking which make greens greener, rice fluffier and coffee and tea more flavorful. Water ionizers usually have at least 3 levels of intensity to choose from. This is mainly because purified & ionized water is extremely detoxifying; people who have toxins built up in their system can suffer reactions such as headaches or diarrhea. This is especially true of the elderly because they often have built up many toxins in their bodies over the years. Also those who have a very poor diet(toxic , processed, refined foods , acidic – i.e. sugar, refined cereals, “veggies” with pesticides, chemicals, animal products grown with hormones, injected , chemical additives, colorants and preservatives etc- tipical diet) or have taken a lot of medications over the years. Having different levels of pH available simply allows people to build their tolerance for ionized alkaline water more slowly if they wish. 3 levels of acid ionized water ~ Why?Enjoy the many ways you can use acid ionized water; for your skin, for your plants, for your home hygiene and more.The skin is naturally an acidic organ. People who regularly use acidic ionized water to wash their bodies tend to have a younger looking skin than those who use hard water. Hard water is alkaline water usually due to the presence of excess calcium. By applying acidic (soft) ionized water to the skin it will help to clear up excess bacteria (reduce acne and other blemishes) and will work like an astringent to tighten up the skin and remove wrinkles. In Japanese hospitals acidic water is used to help sterilize wounds, treat diabetic ulcers and keep hospitals clear of infectious bacteria and viruses. Acidic ionized water can also be used to reduce inflammation and itchiness caused by insect bites. Pure /filtered water (non-ionized) ~ Why?Pure / filtered water can be important if you or visitors are on an acid-based drug regimen. Although alkaline micro clustered water helps the absorption of many supplements and reduces the dosage requirement, it may affect drugs designed to be taken with acid or neutral water. How does the AlkaViva Vesta GL 988 water ionizer & purifier display pH and ORP? 2) many popular water ionizer models continue to include that feature. Based on these factors AlkaViva decided it was time to keep pace and offer it. The feature works by applying an algorithm that factors in all the variables at each water ionization setting to give you an approximate pH/ORP value (at median power delivery for the selected setting). It is best to use the pH/ORP display as a guide in helping you choose the right level of water ionization, not for obtaining truly accurate values! For absolute certainty, use the pH drops we include in each AlkaViva Vesta GL 988 water ionizer and a properly cleaned and calibrated ORP meter. And remember, based on your source water you can always expect some variance in your results! How exactly does AutoAdjust™ work? Why is it better? It is really important to understand the answer to this and other questions to see how big a leap the AlkaViva Vesta GL 988 water ionizer & purifier represents in water ionization technology! Varying mineral content in source water is one of the biggest water ionization performance issues . Water mineral content changes from place to place (often being different within a single municipal supply), from season to season and even from day-to-day. NO other water ionizer has ever been able to overcome this automatically, until now! Electrical energy is applied to water ionizer plates in waves of current. You can think of the waves as a “pulse”. When an SMPS power supply delivers its pulse, it pulses the current in short bursts. When a transformer delivers its pulse, the wave occurs as a long sustained pulse. 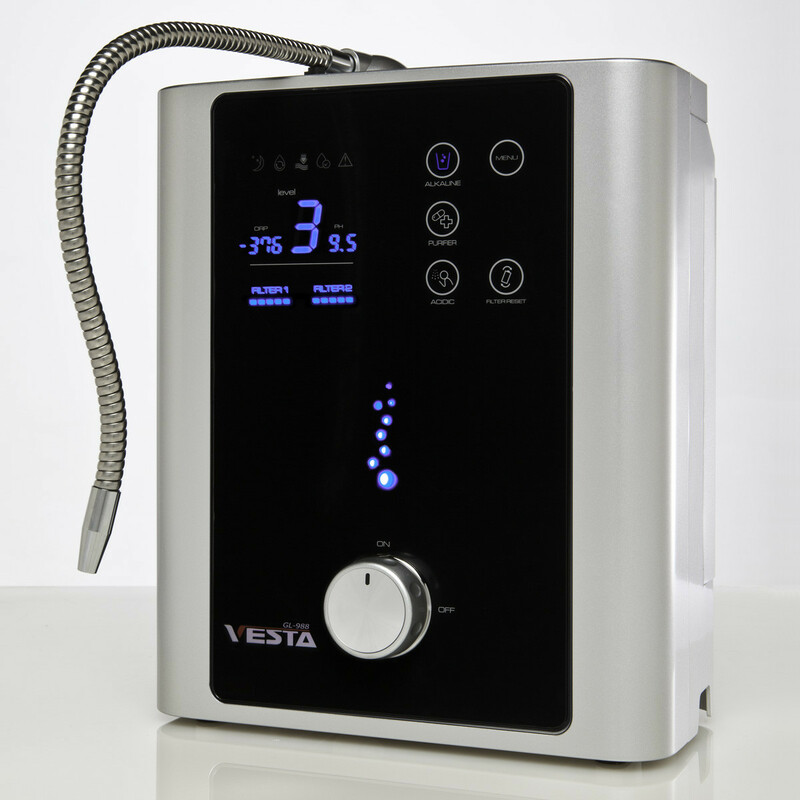 Neither SMPS nor a transformer is capable of adjusting the pulse to match the mineral content in YOUR water.Using the advanced self-diagnostic MICOM circuitry system, the Vesta GL 988 water ionizer’s AutoAdjust™ monitors the conductivity in your water. Conductivity is determined by the presence of minerals in water. The computer chip gets feedback about the conductivity of the water, and in real-time adjusts the width of the pulses to get the best water ionizing results. With AutoAdjust™, the electrical energy is pulsed to very short sharp bursts of energy with varying widths. All other water ionizers SMPS models and transformers alike – deliver a programmed and unchanging electrical pulse that does not vary if the conductivity of the water changes. AutoAdjust™ lengthens the pulse waves in soft water situations, and shortens the pulse waves in hard water areas. This effectively means that voltage applied on water ionization plates is optimized automatically in both hard and soft water situations giving you the BEST water ionization performance possible in relation to the minerlas present in our filtered water before it enters th water ionization cell . Another benefit is in the water ionization. AutoAdjust™ variable pulses are delivered at 512Hz which creates a big difference when compared with a single wave, or constant pulse. The AlkaViva Vesta GL 988 water ionizer’s variable pulses allow the electrodes/water ionization plates to act in a more excited and energetic way. This causes a more active production of oxygen from the electrode and therefore ionized water that is more activated. The result is ionized alkaline water with a bigger change in pH and better ORP (higher pH and more -ORP in alkaline water produced by the water ionizer). The last benefit (but certainly NOT the least) is as a result of AutoAdjust™, calcium and other minerals cannot attach themselves to the electrodes/water ionization plates. NO deterioration in water ionization performance, NO faults & LONGER LIFE( HQ water ionization Performace, Fiability & Durability). Why has Emco Tech chosen the SmartSwitchTM power supply in the Vesta GL 988 water ionizer instead of a transformer? Historically Emco Tech was not impressed enough with the stability or reaction time of the older versions of SMPS to employ them. The AlkaViva Vesta GL 988 water ionizer employs the most-advanced and latest SMPS technology available so AutoAdjust™ can perform optimally. Previous versions of SMPS used in water ionizers did not have a fast enough reaction time to be capable of adjusting pulse width on demand and in real time. This next-generation SMPS used in the AlkaViva Vesta GL 988 water ionizer & purifier is able to deliver that functionality as well as enhanced stability and power saving benefits (it only uses the amount of power necessary to ionize water properly depending on water mnerla content ). This does not mean there is anything wrong with a transformer based AlkaViva water ionizer; it just means the AlkaViva Vesta GL 988 water ionizer & purifier takes advantage of the hottest new technological advancement in water ionization. How does the new water ionization cell cleaning system in the Vesta GL 988 water ionizer compare to the other water ionizers and to the DARC cleaning system?DARC cleaning was, until now, the zenith of water ionization water ionization cell cleaning technology. The new AlkaViva Vesta GL 988 water ionizer & purifier offers you the same effective auto cleaning and convenience. Like DARC, it cleans the water ionization cell while you use it, you never have to wait during cleaning and you can rest assured that water ionization plates are kept as clean as possible. 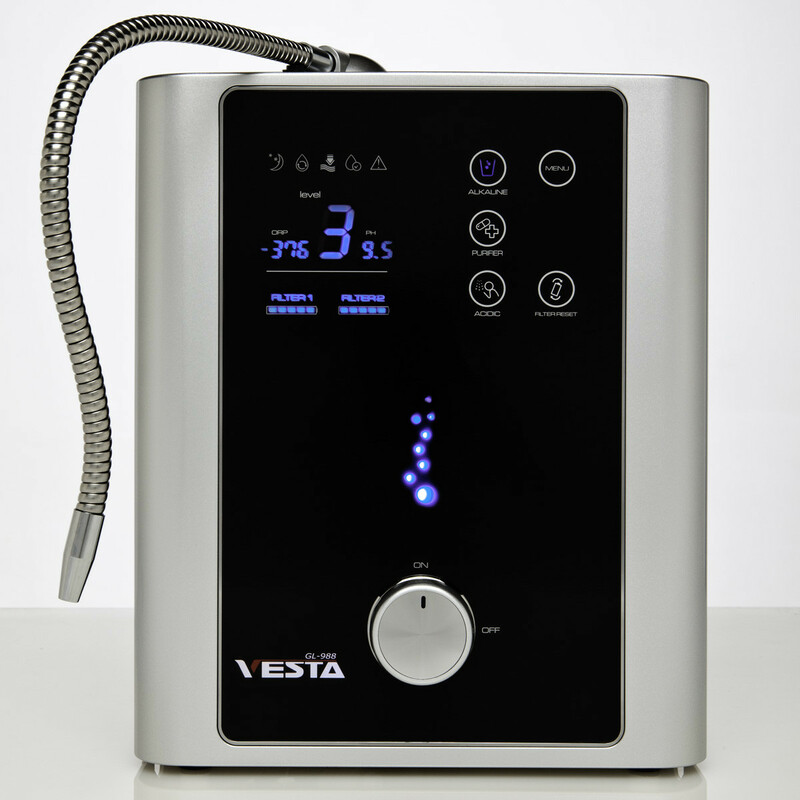 The AlkaViva Vesta GL 988 water ionizer ‘s new user-friendly system cleans two ways. First, it introduces a new twist on continuous cleaning. By working with AutoAdjust™ it “pulses “ the electrodes with electrical current so quickly during water ionization that calcium and other minerals simply don’t have the time to form a bond with the metal. Then, the water ionization plates receive an acidic water bath after every use for extra insurance. We loved DARC water ionization cell cleaning system and saw its effectiveness time and time again as AlkaViva Jupiter Athena JS205 water ionizer won side-by-side water ionization performance testing. as well as TIME DURABILITY testing in real life We really love the new AlkaViva Vesta GL 988 water ionizers ‘s cleaning and think it will prove just as effective, but also offer improved durability due to the elimination of the solenoid valves that ran DARC. Another ingenious first from Emco Tech! We are an authorized AlkaViva distributor and guarantee caring and professional customer service as well as lowest price for water ionizers, filters ,faucets & accessories imposed by AlkaViva. We guarantee top value and service and no dishonest discounting on inflated prices! Backed by Alkaviva 100% customer satisfaction policy. The FIRST water ionizers in USA to come with a limited lifetime warranty.